A few weeks back I saw a post by fellow photographer David Howells about an encounter he had with a Silver Fox while up taking sunrise images at Signal Hill. 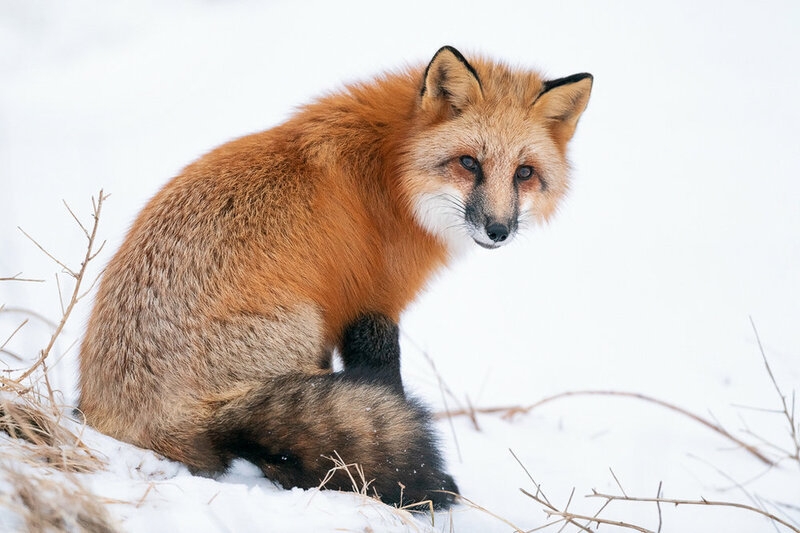 Here in Newfoundland we have three types of foxes the Red Fox, Silver Fox(which is actually a melanistic form of a Red Fox) and the Cross Fox (which Newfoundland has its own subspecies). I have been fortunate enough to have encounters with both the Cross Fox and the Red fox but I had yet to see a Silver Fox; so I know I had to jump at the opportunity. Before diving deeper into this blog post I want to point out that heading to this location I knew this fox would be habituated to humans. Over the years other foxes have shown up in the parking area and the cliffs facing the ocean. Sadly these foxes often become the victim of people feeding them creating the dependency for the free handout and disrupts their typically desire to hunt. I have avoid trying to photograph the foxes here in the past but getting a rare opportunity to see a Silver Fox pushed me to this location. Shortly before sunrise I pulled into the main parking area and it didnt take long to spot the fox along the hill side. The sun hadn’t yet cracked the horizon but I grabbed my gear and headed out to at least grab a few high ISO frames in case the Fox decided to head off to hunt. Of course as suspected it approached looking for a handout but once it realized it wasn’t getting one it continued its search for food. In the image below you can see the fox digging for its prey in the snow/dry grass. As I sat and watched this young fox hunt the early morning sun broke free of the clouds for a brief moment bathing this beautiful face in golden light. The fox continued to move along the cliffs in search of food and before slipping out of sight I grabbed this final frame which I thought was cool as it peeked through the tall grass. Both Foxes spent much of their time chasing each other up and down the cliff side playing and searching for food. It saddens me to know people feel the need to feed these foxes as it was clear on this morning that they are very successful hunters and that there is plenty of food for them. If only people could learn to enjoy wildlife and let nature be wild. The morning session was another great success and the snowy conditions provided a great scene to capture some beautiful images. Here are a few more from that morning. I hope in the end these foxes do well and that they continue to hunt on their own. We all need to do our part to keep nature safe and feeding them is not one of them. Thank you so much for taking the time to read this blog entry and please if you come across a fox or any wild animal please refrain from feeding it, let nature be wild. If you haven’t signed up yet to my Newsletter I invite you to do so at the top of the page. My Newsletter contains bonus photograph tips, any upcoming deals on my eBook and It is also a great way to be notified when I post new content.